Mumbai has been witnessing an overall slowdown with most localities witnessing degrowth or negligible rise in capital values in the quarter ending September compared to the quarter ending June this year. Mixed market sentiments, anticipation of change in government and general economic slowdown in the economy have kept a check on the overall rate of capital value growth. Thane and the region beyond Thane led the overall capital growth of Mumbai with an average growth of two per cent in the Jul-Sep 2014 quarter over the preceding one. Navi Mumbai and the Mumbai Metropolitan Region (MMR) have registered a growth of one per cent attributable mainly to consistent low demand. 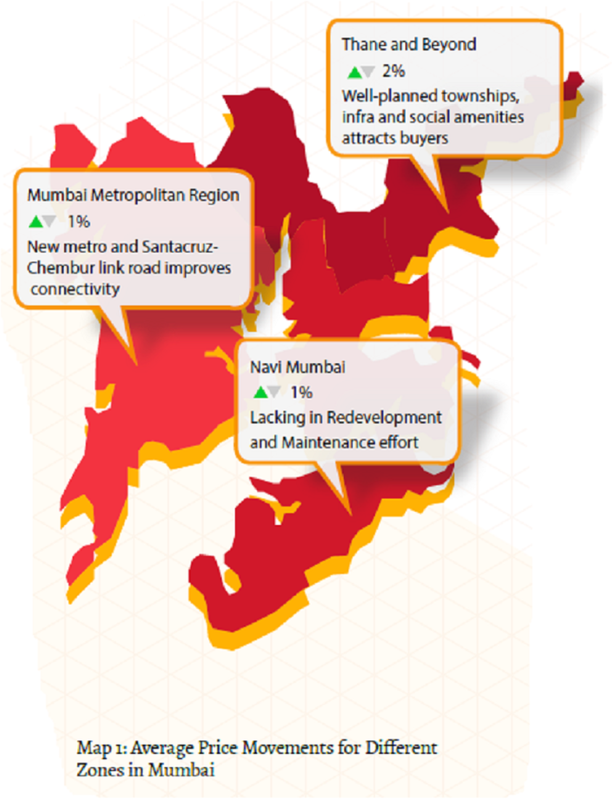 However, select localities such as Ghatkopar, Vile Parle and Vasind have stood out owing to strong infrastructure, proximity to business hubs and better affordability. Ghatkopar topped the list with a 20 per cent rise in capital values riding the wave of a recently completed Versova-Andheri-Ghatkopar phase of the metro project that has taken care of its connectivity woes. Jogeshwari (West) and Oshiwara registered a growth of 14 per cent and 11 per cent respectively after the Eastern Expressway Link and the Santacruz-Chembur Link road became operational. The positive impact of all the infra developments also rubbed off on rental rates across MMR where most localities saw an average rise of five per cent in rental values in the last year. Hiranandani Gardens-Powai, Andheri (East) and Juhu topped the list of such localities with increase in rental values to the tune of 34 per cent, 18 per cent and 12 per cent respectively. Further providing the proverbial shot in the arm of other MMR localities such as Chembur and Santacruz (East) are ambitious mass rapid transportation projects like the Mumbai Monorail (partially operational) project that is currently under progress. While Chembur saw a rise of six per cent in the quarter ending September, capital values in Santacruz (East) rose by four per cent. Vasind, a locality beyond Thane, saw an increase of about 17 per cent owing to its affordability. 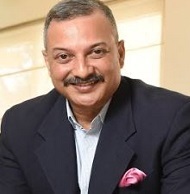 Many real estate developers including budget housing builder, Value Budget Housing Corp, is setting up projects offering units in the range of Rs 2,500-3,000 per sq ft. Demand for apartments in Vasind is being driven by working professionals from Thane and others working in the industrial and manufacturing bases at Atgaon and Vasind. 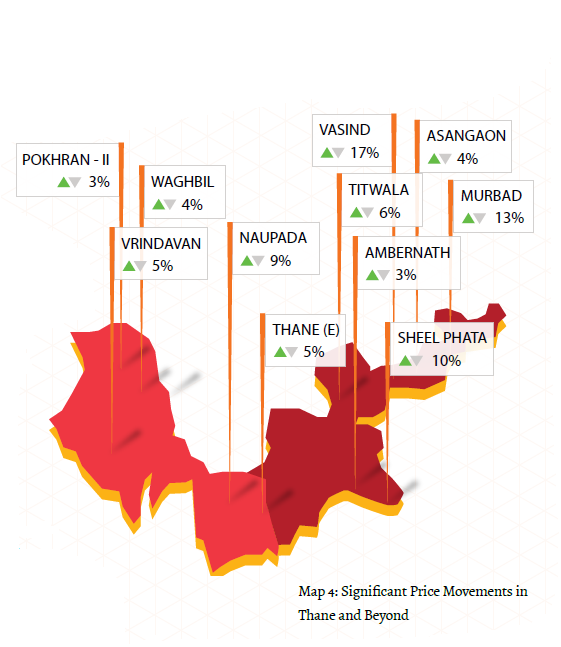 Several localities from Thane and beyond including Sheel Phata, Murbad, and Naupada have reflected impressive increase in capital values over the last two quarters. Value of residential homes rose by 10 per cent, 13 per cent and nine per cent respectively. The residential land data highlights that Panvel has been the frontrunner, with 44 per cent rise in plot values in the Jul-Sep quarter compared to the Apr-Jun quarter this year. Several proposed developments such as Sewri-Panvel Trans Harbour highway, SEZ logistics park and Panvel-C.S.T elevated train corridor have contributed to this rise. Shahpur and Murbad, localities beyond Thane, have witnessed a quarter-on-quarter appreciation of approximately 17 per cent and 13 per cent respectively for residential land. The ongoing construction of Mumbai-Nasik Highway in particular has given a boost to connectivity making this rather affordable stretch even more attractive. MUMBAI > Central Suburbs, Andheri-Dahisar, Mumbai Harbour, South and South West Changes in capital values ranging from -16 per cent to 20 per cent across this region were driven by road-rail infra improvements. Substantial dips were also observed in about a third of the localities although this is attributable to temporary fluctuations in demand and supply. The overall trend stayed positive. Localities along the Central Mumbai suburbs and Mumbai Andheri-Dahisar have benefited greatly due to the completion of the Phase I of Mumbai metro line in June 2014. Also referred to as Metro I or the Versova-Andheri-Ghatkopar (VAG) corridor, the 11.40 km line is fully elevated and consists of 12 stations from Versova to Ghatkopar. The line connects the eastern and western suburbs of Mumbai. Earlier, east-west connectivity was limited to BEST buses, autos or taxis as there was no suburban rail link. With the opening of the Phase I metro line, localities such as Ghatkopar (East), Vile Parle (East), and Andheri (East) have witnessed a rise of 20 per cent, 15 per cent and five per cent respectively in the Jul-Sep quarter compared to the Apr-Jun quarter this year. Some of the top localities in Mumbai Andheri-Dahisar neighbourhood that have felt the ripple effect of the Versova-Ghatkopar metro line are Jogeshwari (West) and 4 Bungalows, having witnessed a rise of 14 per cent and nine per cent respectively in the latest quarter compared to the previous one. Both Oshiwara and Saki Naka, also part of Mumbai Andheri, saw an 11 per cent increase in the same time period. The Santacruz-Chembur Link Road (SCLR) was made open to the public on 18 April 2014. This has pushed up prices in Chembur, Santacruz (East) and Bandra (East), by six per cent, four per cent and eight per cent respectively in the Jul-Sep quarter compared to the Apr-Jun quarter. The SCLR, a 6.45 km long arterial road in Mumbai, connecting the Western Express Highway (WEH) in Santacruz with the Eastern Express Highway (EEH) in Chembur has provided respite to lakhs of commuters after a long wait. Home values in South Mumbai’s Lower Parel increased by nine per cent in the quarter ending September 2014 continuing a year long increase of 15 per cent. On the other hand, trends changed for Kurla (West) in Central Mumbai Suburbs that saw a rise of eight per cent quarter on quarter after a marginal degrowth to the tune of one per cent whole of last year. 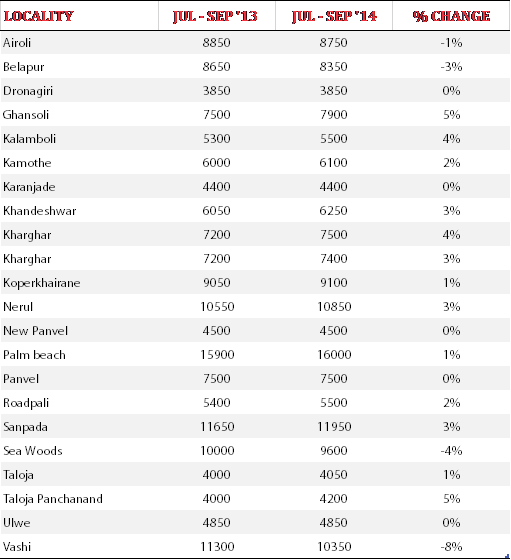 Some of the infrastructure developments (either underway or proposed in MMR) such as Mumbai Trans Harbour Link or Sewri-Nhava Sheva Trans Harbour Link are also contributing to the increased capital values in localities such as Sewri, Worli and Lower Parel. 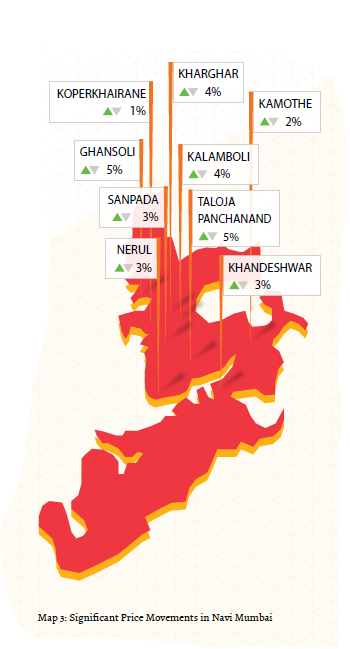 These localities have seen an increase in capital values by 12 per cent, six per cent and nine per cent respectively. The worst performers with respect to capital value growth this quarter were Sion (East), Parel, Kanjur Marg (East), Wadala East, Tilak Nagar and Dadar (East). Sion (East) saw a fall in capital vaues to the tune of 16 per cent, whereas for Parel, the figure was 14 per cent. Kanjur Marg (East) fell by 13 per cent and Wadala (East) dipped by nine per cent. Fall in capital values of these localities appears to be unsystematic. If one delves into annual trends for the same localities, there have been intermittent dips followed by sudden spurts in capital values not backed by any specific reason. There were also localities such as Breach Candy, I C Colony, Kandivali (East) and Powai that did not see any change in capital values in the latest quarter. This too, seems like a temporary phase as these localities have previously witnessed an upward trend. 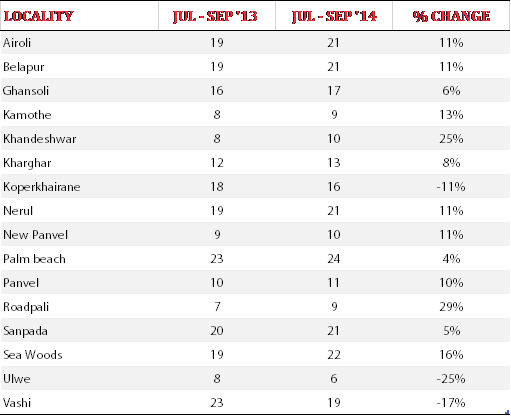 With respect to rental values, Powai witnessed a rise of 10 per cent, while Juhu saw a 12 per cent rise in the Jul-Sep 2014 quarter compared to the same quarter in 2013. Powai and Juhu are the popular destinations for working professionals to rent as these localities are purely residential with few office spaces. 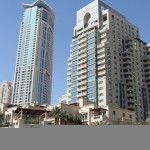 There are several popular schools, colleges, hospitals and entertainment zones in the vicinity. The popular configurations are 2BHK and 3BHK apartments. Most of the localities in this zone saw a rise in rental values with the exception of Chandivali, Chembur (East) and Goregaon (East) that witnessed a dip of eight per cent, three per cent and six per cent respectively in quarter ending September this year over the corresponding quarter last year. Average capital values in this part of Mumbai range from Rs 25,000-30,000 per sq ft, which translates into Rs 2.5 crore to Rs 3 crore for an area of 1,000 sq ft. In contrast, average rentals for a 1,000 sq ft apartment are around Rs 44,000-Rs 50,000 per month. Since home prices are on the higher side, a majority of professionals settling in Mumbai prefer to rent making the rental scenario more fluid. This is probably why average capital value gain in the quarter ending September 2014 was only one per cent whereas the figure for average rental values was five per cent. MUMBAI > Navi Mumbai Navi Mumbai has benefited due to the social infrastructural developments although the positive impact appears to have been restricted to a few localities. Affordability has been one of the strengths of this part of the city. However, the lack of governmental initiative to improve or maintain existing buildings has led to stagnation in demand, as well as values. 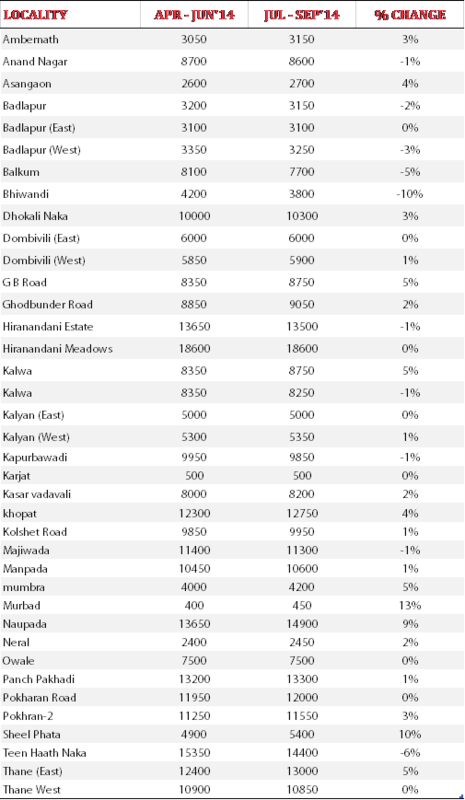 The range of percentage increase in Navi Mumbai has been lower as compared to other zones. This can be attributed to the mixed consumer sentiments that have governed this part of the city till recently. Moreover, the delay in commencement of the construction of Navi Mumbai International Airport has not gone down too well with the investors and existing residents as that has led to a delay in other projects as well. 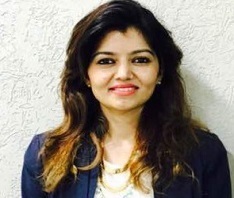 The top performers in Navi Mumbai in the Jul-Sep quarter as compared to Apr-Jun quarter of 2014 are Ghansoli and Taloja, both having witnessed a rise of five per cent in capital values each. They are followed by Kalamboli and Kharghar that saw a four per cent hike in capital values each. The latest Sion-Panvel highway included widening and concretization of the stretch to the east of Vashi bridge, building of new overpasses at Sanpada railway station, Nerul, Uran and Kamothe. This has had an immediate impact on capital values on the above mentioned localities. Sion-Panvel highway also benefitted Nerul and Sanpada, that both saw a rise of three per cent in capital values each in this quarter against the previous quarter this year. Meanwhile, Kamothe and Roadpali witnessed a rise of two per cent each in values in the latest quarter. The future of both these localities looks promising as they continue to witness new project launches by reputed developers such as Geomatrix, Today Group, 5P Group, Laxmi, Juhi Developers, Indiabulls, Marathon, Shagun, Platinum, Satyam Developers and Gajra Group. The localities that witnessed a fall in capital values in the latest quarter in Navi Mumbai include Vashi, Sea Woods, Belapur and Airoli, with an eight per cent, four per cent, three per cent and one per cent decline respectively. As per recent news reports, Vashi is in urgent need of redevelopment as the JN1 and JN2 type buildings here that are built by CIDCO are in a poor condition. 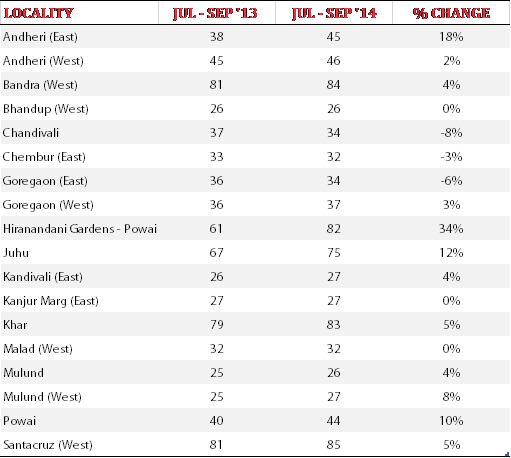 Other localities such as Panvel, Ulwe, Dronagiri and Karanjade saw no change in values in the same period. A large number of buildings in these locations are facing wear and tear and are awaiting concrete action from municipal bodies. Both the lack of maintenance of existing infra and the presence of illegal construction are concerns for Navi Mumbai residents. If there is an overhaul in the city’s infrastructure, chances are that demand and capital values will begin to rise at a better rate. 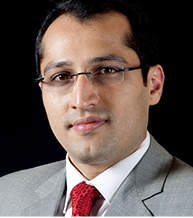 Redevelopment by key builders will infuse fresh hope in the residential market. Developers such as Progressive Group, Marathon, Kalpataru, Indiabulls and Arihant Universal are some of the key players in Navi Mumbai. The latest announcement allowing 2.5 Floor Space Index (FSI) for old and dilapidated CIDCO-constructed buildings is likely to open up the real estate market further, paving way for the above mentioned builders to redevelop. Several other infrastructure projects that are facing incessant delays are Mumbai Trans-Harbour Link (MTHL), metros and elevated CST-Panvel air-conditioned rail corridor. The rental scenario is more promising with most localities seeing a double digit rise in rental values in the Jul-Sep quarter compared to the same quarter in 2013. Average capital value growth was one per cent in Navi Mumbai, whereas growth in average rental values was to the tune of seven per cent. This is primarily because most middle-class working professionals find Mumbai city unaffordable and are hunting for locations in Navi Mumbai due to connectivity via local train junctions and highways. Preference for renting has led to the emergence of affordable localities such as Sea Woods, Kamothe and Nerul that have seen a rise of 16 per cent, 13 per cent and 11 per cent in rental values respectively. Belapur, Kharghar and Sanpada are other popular destinations for rent, with an increase of 11 per cent, eight per cent and five per cent respectively. MUMBAI > Thane Thane and the region beyond has seen an average rise of two per cent in capital values in the Jul-Sep 2014 quarter over the preceding quarter and boasts of the maximum number of localities in all of Mumbai that have grown positively in the same period. As compared to Navi Mumbai’s one per cent growth, Thane, at a growth of two per cent, is coming up as a more lucrative destination. This is primarily because the localities here are better planned and developed, with Vasind, Murbad, Sheel Phata and Naupada being the frontrunners in the July-Sep quarter of this year. 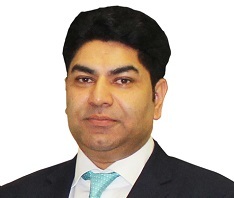 The region has gone through a gradual makeover during the course of the last five years and will be seeing some new residential launches by established developers such as Hiranandani Developers, Lodha Group, Kalpataru Group, Wadhwa Group, Runwal Group and Puranik Builders in the future. 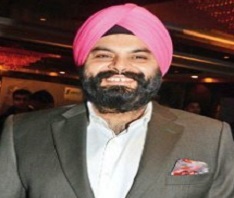 Murbad, Sheel Phata and Naupada saw a rise of 13 per cent, 10 per cent and nine per cent respectively, in this quarter. Sheel Phata has been an attractive destination for many owing to the huge Lodha township. Following suit, developers such as Cosmos Group, Sapta Shree Builders & Developers, Mukta Developers and Runwal Group have also launched projects leading to capital price increase. Murbad and Naupada have gained popularity owing to their affordability as compared to Ghodbunder Road. The latter was a destination for affordable residential options. However, off late, transaction volumes have been stagnating and demand is shifting to other upcoming destinations. Such destinations also include locations such as Pokhran-2, Ambernath and Vartak Nagar that witnessed a price rise of three per cent each in the quarter ending September compared to the preceding quarter this year. Other localities that saw price rise in the range of four per cent to six per cent include Titwala, Kalwa, Asangaon, Khopat and Waghbil. All these localities have emerged as upcoming destinations in Thane and are likely to see further growth in the coming months. As for the localities that witnessed a downfall, Bhiwandi, Teen Haath Naka and Balkum topped the list, with a 10 per cent, six per cent and five per cent fall, respectively, in the latest quarter compared to the previous quarter this year. Bhiwandi is popular as a commercial destination, with 70 per cent of the activities being commercial in nature, mostly with warehouses and textile manufacturing units. There is hardly any scope for the locality to grow as a residential location. Currently, there is no construction activity taking place in Bhiwandi. Teen Haath Naka, on the other hand, is an old part of Thane, mostly with developed buildings that are in need of redevelopment. The locality is awaiting commencement of re-construction from the government’s end. Badlapur (West) too witnessed a three per cent fall in capital values in the latest quarter compared to the previous quarter this year. However, this seems to be a temporary dip as this locality has been attracting a lot of developers and is likely to witness a turnaround. In terms of rental values, Thane (West) and Hiranandani Estate each witnessed a rise of five per cent in the July-Sep quarter compared to the same quarter in 2013. 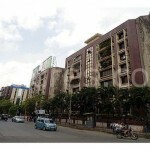 Thane (West) is witnessing residential townships by established developers, which is attracting masses to this locality. The rental values here are within the range of a middle-income group (MIG), between Rs 20,000- Rs 25,000 per month for an apartment of size 1,000 sq ft. Your writing articles about the “Mumbai Insite Report Jul-Sep 2014″ Study this content great. Yo, good looking out! Gonna make it work now. Useful news about the real estate. When this article was written loading used to be 30%. Now it is 40%. So when you buy a 100 sq. ft. where earlier one used to get 700 carpet is getting 600 carpet area. For e.g. Mulund has 14000 rate. so earlier it was equivalent of 20,000 per carpet sq. ft. but even though rate is same one will end up paying 23,333 per carpet sq. ft. which is 16.5% more.